Susan Macmillian's compelling documentary explores the tensions between our most cherished myths of girlhood and the difficult life choices girls face in the real world. The film gives special attention to how girls have been forced to navigate changing expectations in the wake of the women's movement on the one hand, and a commercial culture that trades increasingly in the sexualization of young girls on the other. Along the way, it weaves the voices of a diverse group of girls with analysis from leading experts and researchers in the field, including Lynn Phillips, author of Flirting with Danger; Joan Jacobs Brumberg, Director of the Body Project; and Deborah Tolman, author of Dilemmas of Desire. Susan MacMillan has taught television/video production at Queens College/CUNY and the University of North Carolina. She has worked in the broadcast industry producing commercials (CBS), educational/documentary programming (PBS) and as an independent Producer/Director. Her documentary Caution: Hurricane Crossing which tells the story of the New York hurricane of 1938 aired on PBS in 1994. 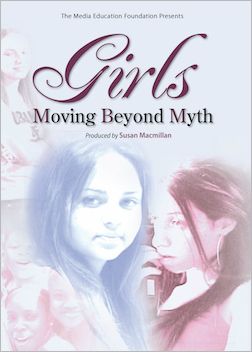 "Girls, Moving Beyond Myth features a wide range of articulate and engaging experts discussing core developmental issues that girls must face in a post-modern, media-saturated world. A diverse group of girls speak with honest voices about their true thoughts and often anguished feeling. This video is educational in the finest sense of the word. It elucidates and motivates."